The Blarney Hotel & Suites Resort is situated just 8 miles from Cork city. It is built in the beautiful and tranquil Shournach Valley close to the historic town of Blarney, renowned worldwide for the Blarney Stone, and the gift of eloquence it bestows on all who kiss it.This unique resort offers true luxury to both the leisure and corporate guest. The on site facilities are a real treat and include a PGA championship golf course co-designed by 2 times major winner John Daly, a Sentosa Spa, state of the art meeting facilities and the excellent Inniscarra Restaurant. The suites at the Blarney Golf Resort is an experience you won’t want to miss, truly a resort for all seasons. The Blarney Hotel Golf and Spa Resort offers 44 beautifully appointed Lodges suitable for golfers, girly pamper breaks, hen and stag do’s and most importantly IDEAL for families. 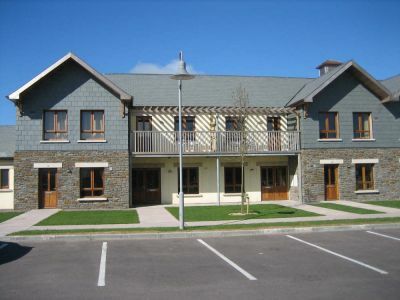 Each Lodge at our Cork Self Catering Accommodation is absolutely stunning and finished with a traditional stone and slate façade. Parking spaces are available outside each Lodge for our residents convenience. With a choice of either 2 bedroom twin en-suite or 2 bedroom double en-suite. The Lodges are designed to give a special living space, airy and bright, yet warm and comfortable. From the Dublin: After taking the M8 Fermoy by pass the M8 will merge into the N8. Continue on this road and at the Dunkettle Interchange roundabout take the 3rd exit, then merge onto the N8 (signposted Cork) Entering Cork. At roundabout take the 1st exit onto the N8 (sign posted Cork). Continue for approximately two kilometres and take the slip road at the Tivoli flyover. Follow the signs for Limerick through Blackpool and onto the N20. At Clogheenmilcon Interchange branch left, then at roundabout take the 2nd exit onto the R617 (sign posted Blarney) Continue forward onto the R617 through blarney and then Entering tower. Turn right up the hill for two kilometres and we are on the right hand side. From Galway/Limerick: Using the N20 Limerick Road Continue forward through Charleville, Buttevant, Newtwopothouse and Mallow. Continue forward onto the N20 entering Rathduff. At Clogheenmilcon Interchange branch left, then at roundabout take the 2nd exit onto the R617 (signposted Blarney). Continue forward onto the R617 through blarney and then Entering tower. Turn right up the hill for two kilometres and we are on the right hand side.